Ahmed Mohammed, justice of the federal high court, Abuja, has granted Andrew Yakubu, former group managing director of the Nigeria National Petroleum Corporation (NNPC), bail in the sum of N300m. Yakubu, who has spent four days at Kuje prison, is also required to present two sureties. 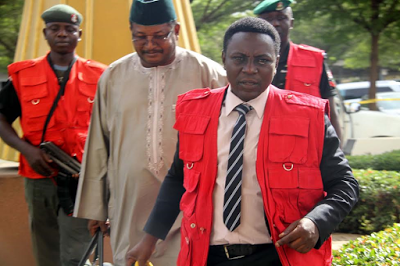 Last Thursday, the judge remanded Yakubu in prison after the Economic and Financial Crimes Commission (EFCC) arraigned him on a six-count charge of fraud. This followed the recovery of $9.8 million and £74, 000 from his Kaduna residence. Yakubu, who pleaded not guilty to the charges, had earlier claimed that the monies were gifts he received from friends. He was alleged to have, as “group managing director of NNPC, between 2012 and 2014, within the jurisdiction of this court, with intent to avoid lawful transaction, transported to Kaduna $9.7million and €74,000’’. Yakubu was also accused of failure to disclose the sum of $9.7 million and €74,000 to the EFCC in his asset declaration form, a crime which contravened Section 27 (3) of the EFCC Act. Ahmed Raji, counsel to the accused person, had prayed the court to grant him bail on self-recognition, but Ben Ikani, counsel to the prosecution, urged it to dismiss the application for bail.